2 8:01 Periods of speed here on the flats. So many turns. 3 8:19 Was pretty gassed at this point, plus it was warm. 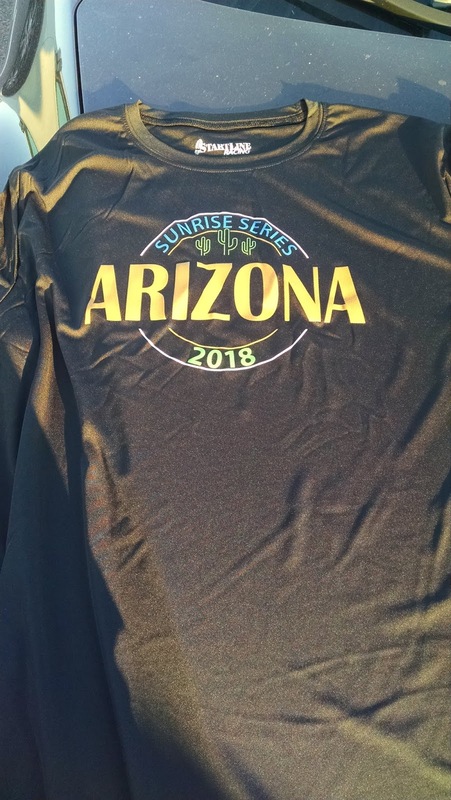 I am doing the Phoenix area Summer Sunrise Series -- a series of 7 5Ks scattered throughout the Phoenix area. I signed up for the entire series in one set -- resulting in about $25 per race. 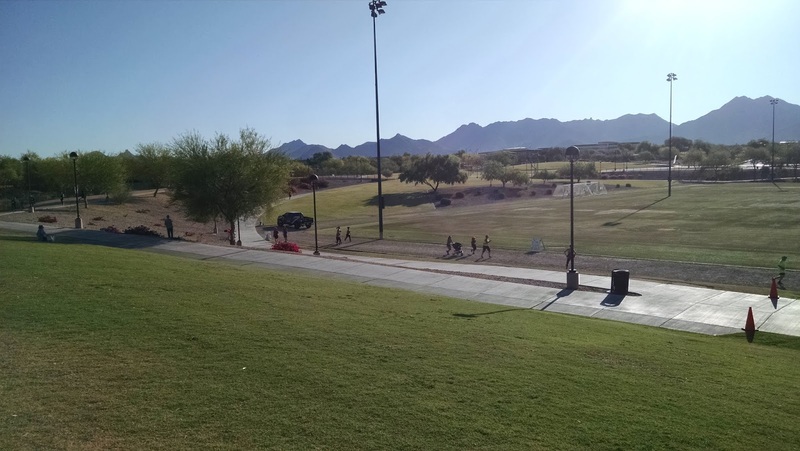 The races occur every two weeks and seem to be held at various municipal parks. 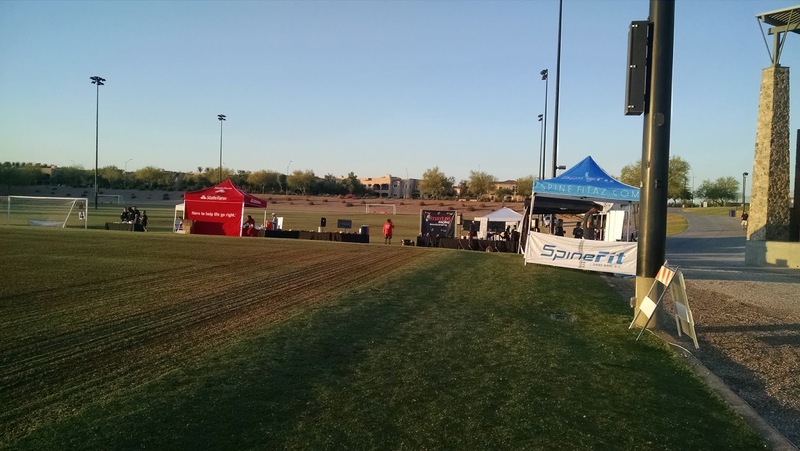 Today's race was at the Scottsdale Sports Complex. 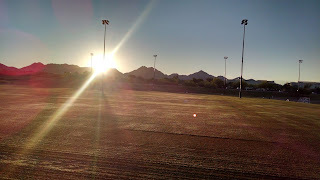 Scottsdale is a pretty nice town and it resembles Summerlin Nevada in that it seems to be pretty well planned, pristine and strong and consistent standards as far as what is allowed for dwellings. The Scottsdale Sports Complex is a collection of walking paths and soccer fields located just minutes off the freeway. They had nice clean bathrooms, ample parking, and it seems to be a great place to hold a small 5K. 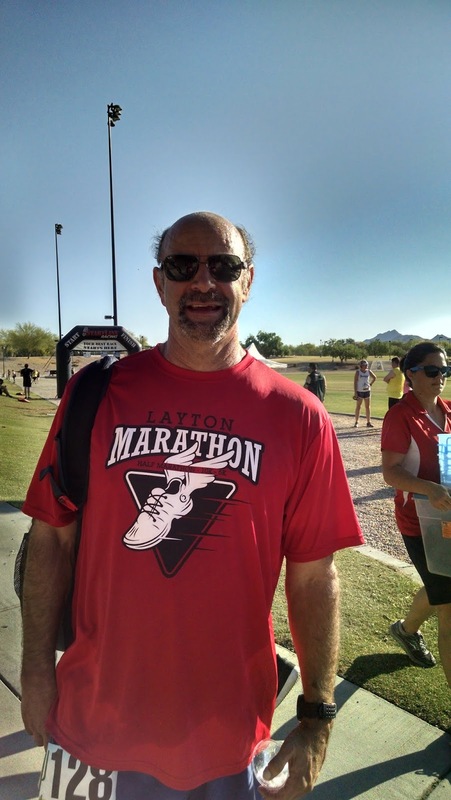 I rolled in about an hour before the race. This is my second running with Start Line Racing and obviously the race director knows what he is doing. I was able to pick up my shirt and in a matter of seconds. I killed some time wandering around and cycled through the bathroom a time or two. I did some light drills and a very short shake out run before determining I was ready to run. The temperature was heating up and just waiting for the race to begin I was working up a little bit of sweat. Also, my legs just were not feeling terribly springy. 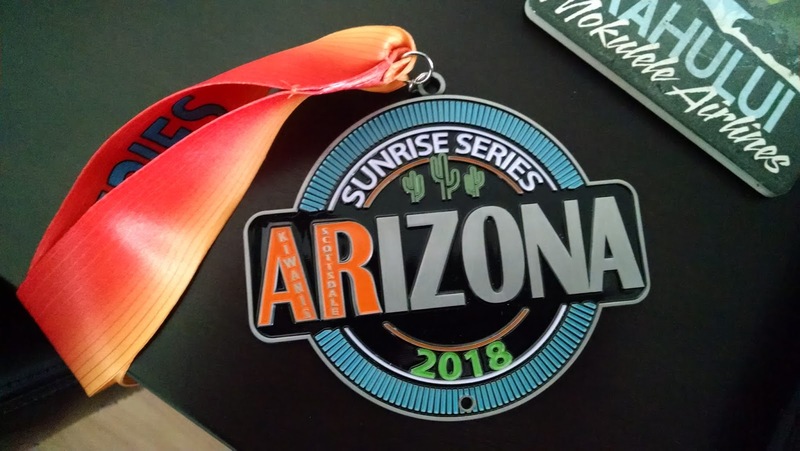 I knew I just had a 5K ahead of my so I could get through it, but I suspect today wasn't going to be an "A" race. 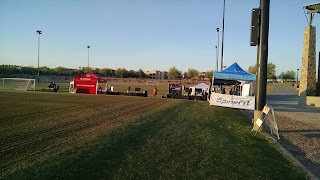 The race started at the stroke of 6:30 and it started off on a gravely chunk of baseball-like warning track. Luckily it was short lived and soon we were running on concrete sidewalk. The first half mile or so was me navigating my way around some of the folks that had lined up in the wrong spot. It wasn't too awful but it was hard to settle into a pace. This course was probably the craziest I've ever run on. 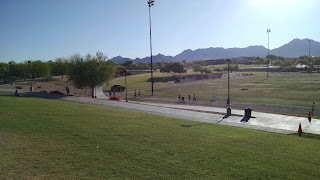 The race was held entirely in the park and there were a ton of turns and what seemed to be switchbacks. The course was marked and marshalled well though and while I had some doubts occasionally as to whether I was going in the right direction, it all turned out okay. Could I run this course from memory 30 minutes after I was done? No way. The first mile seemed to be a lot of uphill. While we aren't talking about gut busting, quarter-mile long hills, but definitely slight inclines and some sharp turns. My Garmin indicates the hills weren't that bad but on a MapMyRun site, it indicates that there were some significant climbs. I wasn't too surprised to see my first mile come out at 8:11. Definitely slower than I'd have liked, but given the hilly nature of the course... totally expected. Also, it was uncomfortably warm. And we aren't even at the full height of summer yet. Mile 2 led us to the flats. I got a little bit of a second wind here and I started passing people. It was fairly short lived but I was able to make up some ground. I also was a little hesitant along this stretch as we started on the second loop -- that didn't quite meet up with my initial expectations on what the course was going to be like. I was expecting to do a second loop but people were heading closer to the finish line. Luckily there was a second loop but if I had been the lead runner, I would've been very confused. The last mile was really tough. My legs were heavily fatigued at this point and it felt so-so hot. I really had to dig deep here. The last third of a mile or so was all downhill so it led me to a sprint to the finish. 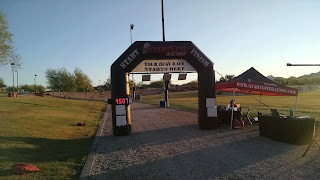 After crossing the finish line, I sauntered over to the refreshment area and got something to drink. They had the typical 5K fare in regards to food: some crackers, peanut butter and bagels, and fruit. I grabbed an apple. Since I am new to town I didn't know anyone. No familiar faces here. I did make small talk with a person or two but it was fairly short lived. I wasn't terribly disappointed nor pleased with my finish time. 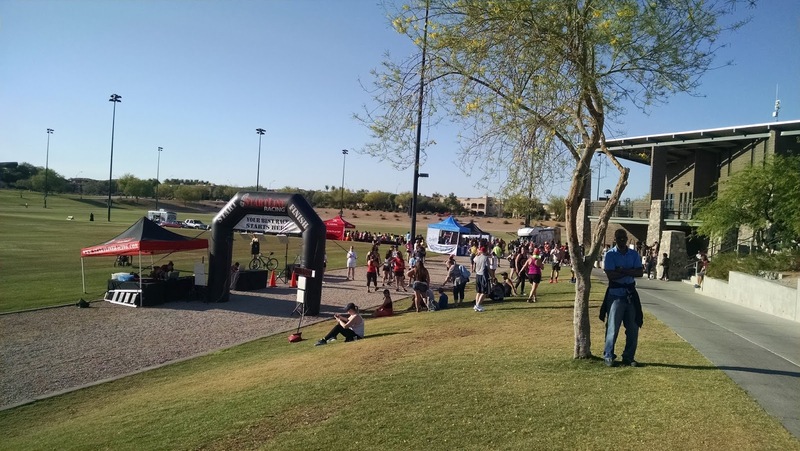 The course was a challenging one and I think most folks were caught unaware in regards to the hilly nature of it. Being that I wasn't feeling too "into it" before the race I knew my time was going to be more or less average. Overall I was pleased with my experience. 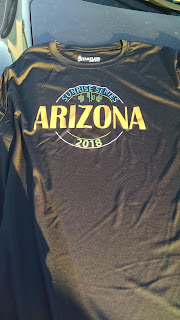 I got the letter "R" for my medal and the t-shirt was nearly identical to the previous race's, however this one was black. I'll definitely wear it. Looking forward to race #3 in the series in 2 weeks!